Professor Denis Dubordieu, consulting winemaker, producer of wines at his own proprietary estates, and full professor of oenology at the University of Bordeaux, has begun a professional collaboration in Campania with Vincenzo Mercurio, oenolgist who is both a native of the region and one of the most promising young winemakers in this part of Italy. 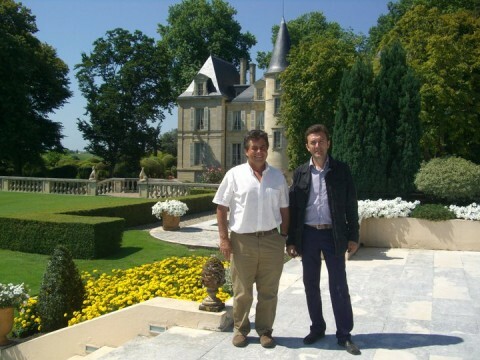 Dubordieu, together with Valérie Lavigne and Christophe Ollivier, works with some of the most prestigious Châteauxof France, among them : Château d’Yquem, Château Margaux Blanc, Château Pichon Longueville Comtesse de Lalande, Château Grand-Puy Ducasse, Château de Pez, Château Beau-Site, Château Haut Bailly, Château Couhins Lurton, Château Chevalier, Domaine de L’Eglise, Château La Croix Ducasse, and Château Cheval Blanc. Vincenzo Mercurio, since 2007 a professional consultant, works with various highly considered estates in Campania in addition to his work outside the regional confines in Sardinia, Apulia, Basilicata, Latium and Calabria. Since March of 2011, this professional has joined his work as a consultant to that of one of the luminaries of world oenology. The idea of the collaboration was born from a common vision of the world of wine and common ideas about cultivating vineyards in addition to a powerful passion for the history of viticulture. What unites this special synergy is the shared interest in the various stages of Mediterranean viticulture, observed in a perspective which is both scientific and anthropological.